Achieve a base flawless to the T with the Complexion Collection set by QVS. The trio helps in semaless application of foundation, blush, highlighter, concealer and contour. 360 Blender: A multi-use brush for seamless blending of foundation, applying the perfect amount of colour to cheeks or subtle highlighting. Contour Brush: Designed with a dense wide head to quickly accentuate and contour with control. Buffing Brush: A 360 brush, ideal for gently buffing concealer to reduce hard lines, applying highlighter to the finer areas of the face to enhance and accentuate when contouring or to bring out the brow bone with a natural shimmer. Explore the entire range of Brush Sets available on Nykaa. 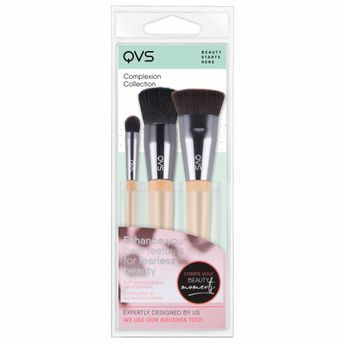 Shop more QVS products here.You can browse through the complete world of QVS Brush Sets .